John further stated that the room is used by all members of the family and the stains that Theresa observed could have been food stains as everyone eats snacks in the room while watching TV. He also advised that this room is usually cleaned on a weekly basis by Theresa and he does not know if his mother cleaned it between times. It seems a little curious that Harvey, who had been with John for most of the previous night, would arrive at the Moxley residence so early. This point was apparently never addressed. Harvey, evidently, assisted John in some informal searching for Martha that morning, but we don't know if he was summoned for that reason, or if he just arrived of his own accord. John told the police they went out behind the house to look for Martha in a "brush pile". On the surface, this is a slightly strange inclination--not to mention an unlikely place to find one's sister. Furthermore, if John was making even a mildly concerted effort at looking at looking around the property for his sister, it borders on the incredible that he never noticed Martha's body, lying only yards away to the side of the house. She would not be discovered until hours later--sometime shortly after 12:00 pm. As to where John went when, according to Theresa, he left in a car, we have no record. It would appear that he did not return to the Moxley residence until after Martha's body was discovered, and the crime scene was secured by the Greenwich Police. In one of his recent interviews with Sutton Associates, John said, curiously, that it was not John Harvey, but someone named John Anthony who arrived that morning for a visit. What significance, if any, this discrepancy bears on the case remains to be seen. The police specifically recorded that young man who was with John that morning, and the previous night, was John Harvey. During John's first interview with the Greenwich Police, he gave a detailed account of his whereabouts from 6:00 pm until he returned home sometime after 11:00 pm, that night. With him during those hours, according to the police reports, in addition to John Harvey, was another friend, Vincent Cortese. 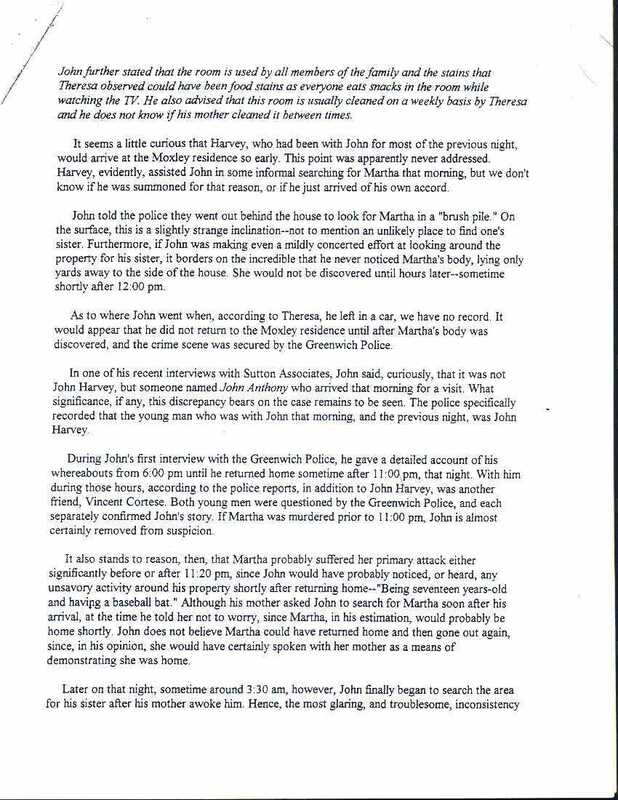 Both young men were questioned by the Greenwich Police, and each separately confirmed John's story. If Martha was murdered prior to 11:00 pm, John is almost certainly removed from suspicion. It also stands to reason, then, that Martha probably suffered her primary attack either significantly before or after 11:20 pm, since John would have probably noticed, or heard, any unsavory activity around his property shortly after returning home "Being seventeen years-old and having a baseball bat." Although his mother asked John to search for Martha soon after his arrival, at the time he told her not to worry, since Martha, in his estimation, would probably be home shortly. John does not believe Martha could have returned home and then gone out again, since, in his opinion, she would have certainly spoken with her mother as a means of demonstrating she was home.